Beaver Creek says it will seek Forest Service approval to build two new lifts, just as it debuts the resort’s 14th detachable lift in Red Buffalo Park. Vail Resorts-owned Beaver Creek is unique in that much of its beginner and low intermediate terrain lies on the upper mountain, giving guests learning to ski and snowboard the high alpine experience many of us take for granted. Just a few miles from its older, more famous cousin, Beaver Creek’s visitation has increased ten percent in just the last five years to well over a million skiers annually. B.C. has grown to encompass 16 lifts despite opening in 1980, decades later than most American ski resorts. Now the 16th largest resort, Beaver Creek’s success came largely through catering to families, a legacy which McCoy Park will build on. Seventeen trails serviced by two lifts will encompass 250 acres left mostly in a natural state. Three quarters of the trails will be green circles with the rest rated intermediate. A McCoy Park Express quad will serve most of the new, gladed runs with a shorter, possibly fixed-grip lift providing egress. The detachable lift will run approximately 4,746 feet with a vertical of 710′ and capacity of 2,400 skiers per hour. The other lift will be just over 2,000 feet rising 300 feet and capable of moving around 1,200 guests per hour. 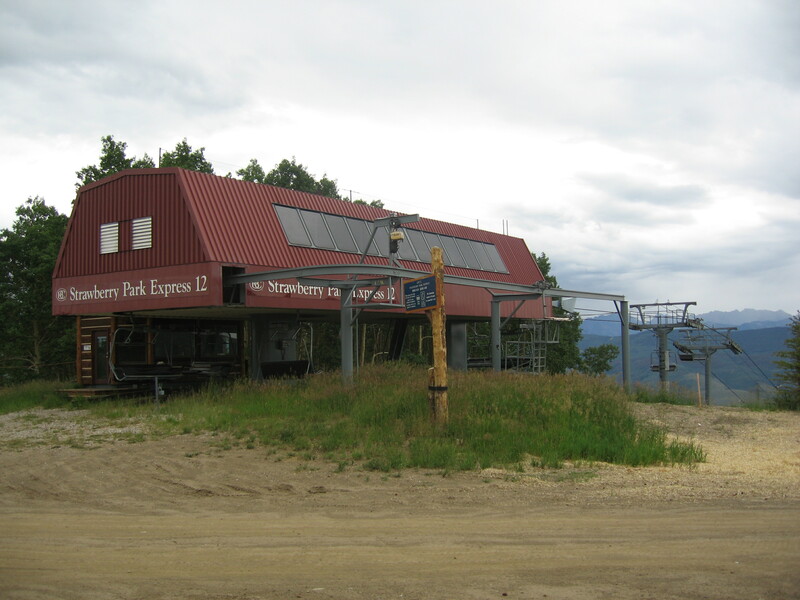 By the time McCoy Park opens, the Strawberry Park Express will be near the end of its useful life and could be replaced by a gondola, providing direct access to and from Beaver Creek Village. As part of the expansion, the 23 year-old Strawberry Park Express will probably be upgraded to a gondola. Strawberry Park already allows for downloading, but a gondola or chondola would better serve beginner folks and families. The almost 7,000-foot new lift would carry approximately the same number of people as the 2,800 pph quad it replaces. Vail Resorts plans to release additional details on the approval process and timeline for McCoy Park in the next few weeks. This piece of news is personal to me as I operated the Strawberry Park Express bottom terminal once a week and rode it to access the Bachelor Gulch Express lift 2 times a week. This was before the Ritz Carlton was built at the base of Bachelor Gulch. There was a really primitive place to eat with a limited menu but that was it in Bachelor Gulch. This was during the 98-99 season. I think. 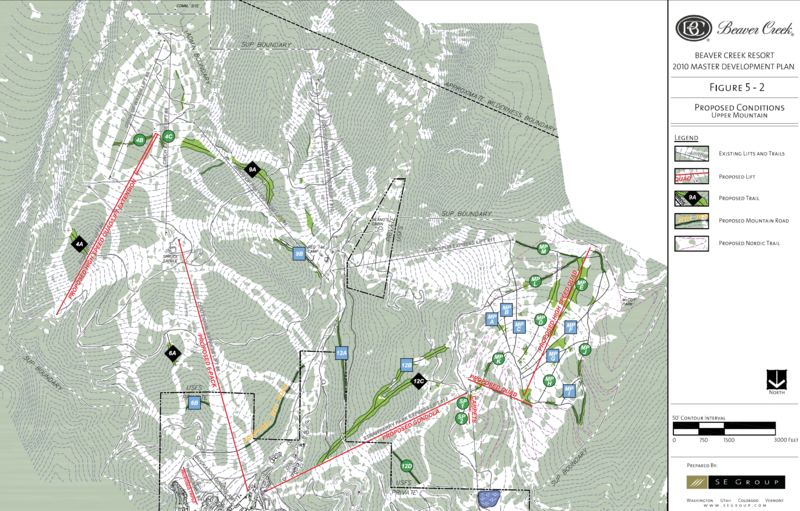 Found this master plan image from 2010 on skimap.org and it has a proposed short double chair at the base of Bachelor Gulch. I had never heard of this, and it seems like it might be tricky to squeeze a double chair on that line. Does anybody know more about this? I am a little surprised that the Strawberry Park lift upgrade is not part of this proposal. Does anyone have any information on why that could be the case? One for another lift replacements generally don’t require much in the way of review by the Forest Service. 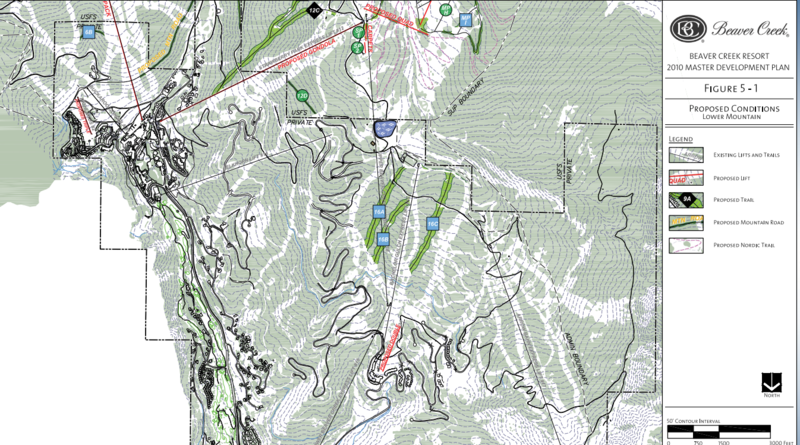 A new Strawberry Park could probably gain the federal blessing in a matter of weeks whenever Beaver Creek is ready. Per the last paragraph of the story below looks like this will open for the 2020-2021 ski season.